Right then, you lot. It's been 1st October 2018 for two minutes at time of writing here in the UK, which means in just one month, we'll have XWA Legends! 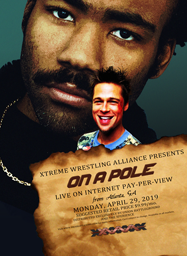 If you've been here before for Legends, you know what I'm about to ask but if you're new and unaware of what Legends is, it's essentially XWA's biggest show- our 'Mania if you will. It's the last show of the year, too- think of it as a season finale- and then we're not back again with new cards until January as we take a break in December. There are no Massacre episodes during Legends, EVERY title is defended, we do the Hall Of Fame and the Piledriver Award noms go up immediately after. it's all a big load of fun! What I need to know, so that everyone gets what they want and we can put together a proper good show, is what you guys want to do and what your plans are in terms of matches, angles, things you wanna do, etc. Get in touch with me, let me know (if there are spoilers, they'll be safe with me so don't worry about that) and I'll make sure you get the tools to make it happen. Oh, and we're doing the Legends: All Access fan festival again this year. Press Conference and all, why not. So as most of you will know, Legends 2018 is my last show in all of E-Fedding for reasons that have been beaten to death now. But as head booker, that begs the question of what happens here after Legends is over, because I won't be booking any longer and I won't really be here much if at all. Well, obviously I want the XWA to carry on without me running it, so I'll be making sure that can happen. Swift and AJ have been doing a remarkable job behind the scenes, but I think it's the appropriate time to bring in some more staff to help with shows, make sure booking is covered, come up with ideas to make things interesting and general day-to-day running of the place. Some new blood to keep it all going. If you are interested in doing this, hit me up. I will be reaching out to people as well. This person would do posters and all the graphical 'make the place look pretty' stuff that I do right now. Preferably someone experienced but it's not essential- I learned it as went along, experimenting with stuff. Swift, bless him, has booked every single episode of Massacre since...my goodness, for well over a year. WELL over. Similarly, I've booked every Supershow (except for the ones I haven't where AJ's taken them). We'd like to expand the Booking Team so that it's more of, well, a team that puts it all together and work together to find new, innovative ideas and things to do here for handlers. We've got the Title Histories. We've got the XWA Top Ten. A person to maintain those would be excellent. You get the jist. So what will I be doing here after November? Well, the current plan is that the ownership of the site will transfer from Angelus to me. I say that, but I've not had chance to chat to Ange about it properly yet so I need to know exactly what it is I'm doing, but that's the plan. I won't be booking or playing anymore but it'll be down to me to renew the site every year, which I'm happy to do. The rest of it will all be down to your new staff. I can't really think of anything else and if I do, I'll just update the post but I just want to say with just over a month left of my running of this place and running towards the end of my characters' storylines, thank you to everyone who has even bothered to come here during my time in XWA and anyone who trusted me to book their character. Hopefully I helped you tell the story you wanted to tell. But enough of that- all-change after November so let's go kick Legends up the arse.